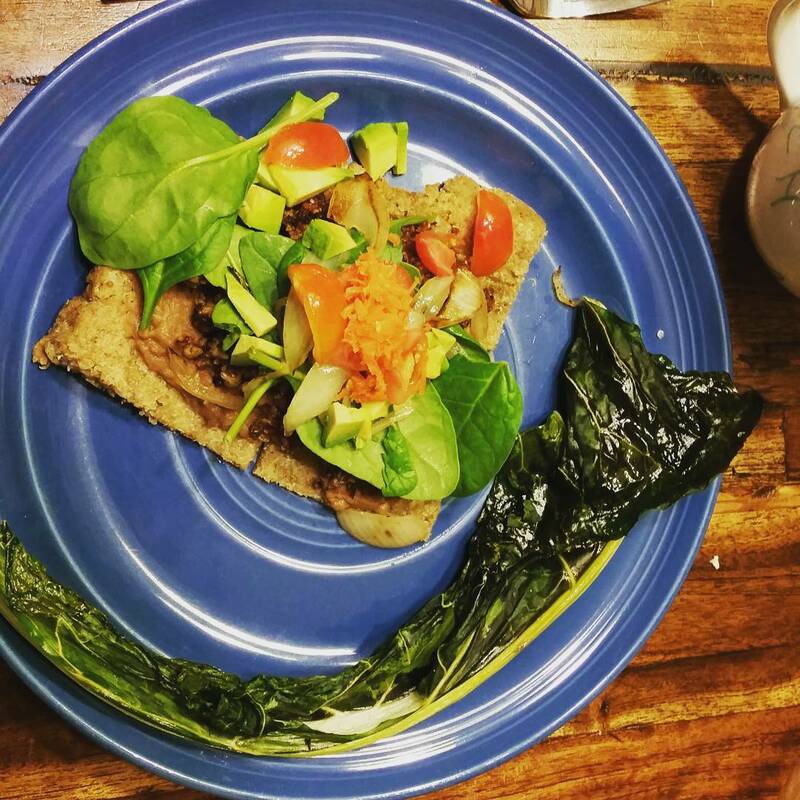 Quinoa pizza, chalupa, quilupa? – helping women with Lupus reclaim their health. solids. She is okay about trying things, but for the most part, she would rather just eat a veggie burger or a PB&J sandwich. The rest of us like to eat a more diverse diet, which leads to a great deal of experimentation to see if everyone’s taste buds can align. This is how the make-your-own Mexican pizza/chalupa or quilupa, as my husband has coined it, has come into being. First you start with about 2 cups cooked quinoa. I’ve found this works best when it’s leftover from a previous meal and had about a day or so in the fridge. For reference, 1 cup dried quinoa makes about 3 cups cooked. Pro tip: buy your quinoa in bulk or online to save some dough. Speaking of dough, that’s what the quinoa will become after you mix it in a food processor with garlic, chili powder, salt, and an egg. Next, roll the dough out to make the pizza crust or chalupa/quilupa part of the dish. 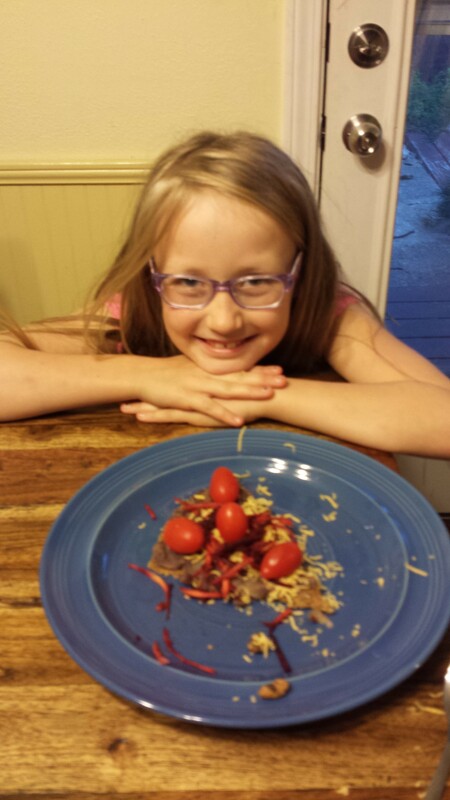 At this point, you have just used a superfood to create the base for a really wonderful, kid-approved dinner. Once baked, add the topping of your choice to make it a meal. We usually have a refried bean base along with an assortment of cooked and raw vegetables, and always, ALWAYS a freshly made guacamole. Add the first five ingredients one at a time in the food processor, giving the food processor a whirl with each new ingredient to make sure everything gets incorporated. Once all ingredients have been added, keep the machine on until a dough ball starts to form. If this doesn’t happen in the first minute, add water a tablespoon at a time until you get the desired consistency. 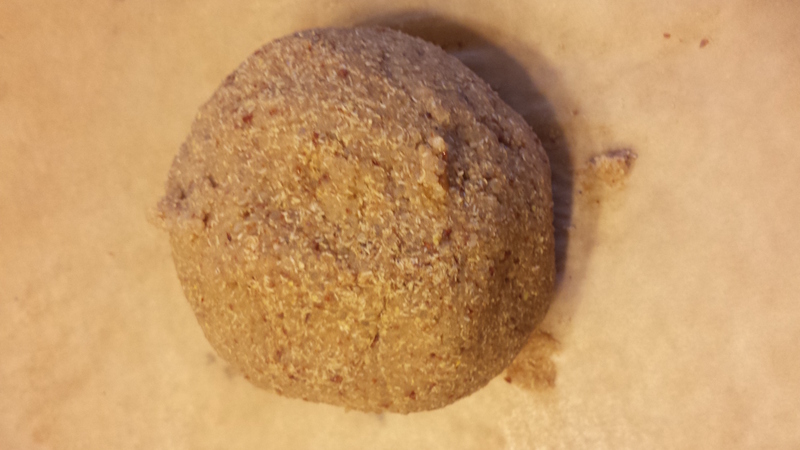 Once the mixture is sticky and forming a bit of a ball in the food processor, scrape it out and pat it into a nice ball (see picture above). Place on a parchment paper lined cookie sheet. 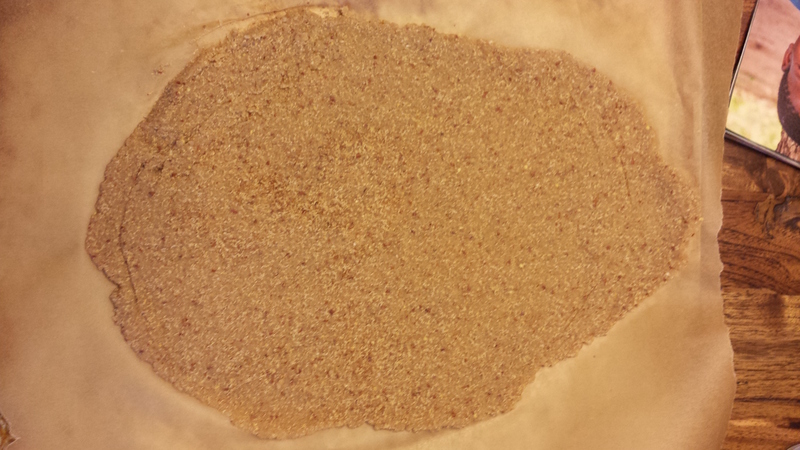 Cover the top of the dough with another sheet of parchment and pat down until you have a nice flat surface. With the parchment still covering the dough, use a rolling pin and roll out the dough until its about 1/4 to 1/2 inch thick. Bake for 15 to 20 minutes until nicely brown and the edges start to peel away from the sheet. Once the the quinoa base is ready to go, each person loads theirs up with whatever they like best. 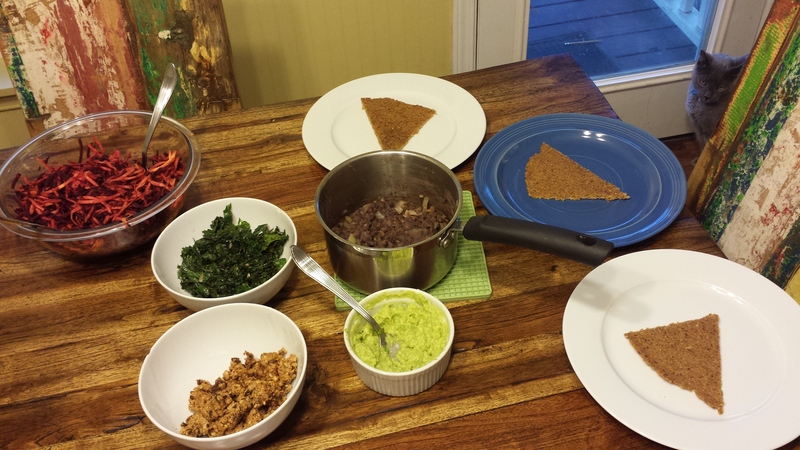 Tonight’s options were walnut “taco meat,” guacamole, sautéed kale, refried adzuki beans, and shredded carrots and beets. The most difficult part of this meal was figuring out what to call it. 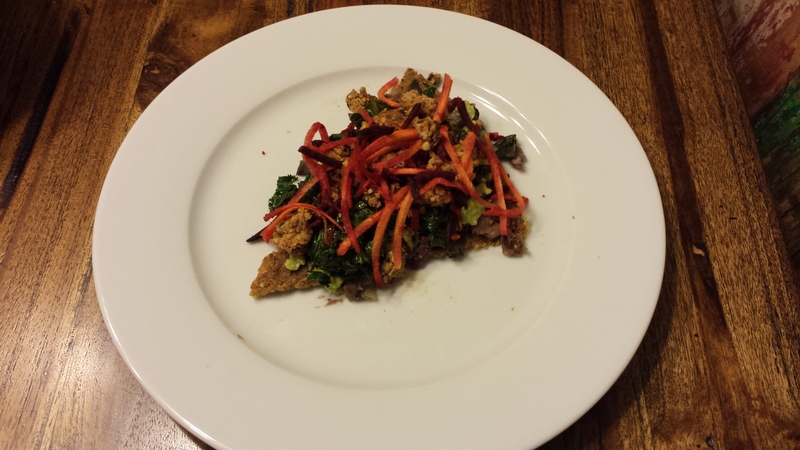 My picky eater proudly decorated hers with almost everything except the kale before devouring it. She wanted me to tell you-all that she “liked it and you should make it.” If that’s not a glowing endorsement, I’m not sure I know what is. Enjoy! Previous Post Food: It’s a personal thing. Next Post Breakfast, can you really have it all?